In the centre of Ferrol, an attractive, seafaring city, the Parador rises up, recreating in its image the essence of a Galician mansion with glazed galleries and a singular marine setting. The decoration displays nautical elements, world maps and navigational instruments in the common rooms and spaces. The main staircase has an ancient lamp from a boat and the maritime motifs abound in the living rooms. The bedrooms are spacious and boast ochre and dark shades; some, with viewpoints and balconies, are favoured by magnificent views over the port. 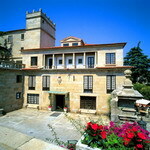 Situated at the highest point of the town of Monforte de Lemos is the San Vicente do Pino monumental complex, comprised of the Keep, the San Vicente do Pino Monastery and the Condes de Lemos Palace; the latter two house the Parador de Monforte's facilities. The origins of the monastery date back to the 9th century, although the current building, erected on the site of an earlier one, is Neo-classical and dates to the 17th century. The 16th century Condes de Lemos Palace, located opposite the monastery, was damaged by fire and then restored in the 18th century. 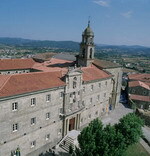 The new Parador is housed in the Santo Estevo de Rivas de Sil monastery, in Nogueira de Ramuín (Ourense). It is located in a region populary know as the birthplace of the 'afiladores y paraguerios' (knife sharpeners and umbrella holders) and is one of the towns in Ourense in which the topography and the confluence of the rivers Miño an Sil create spectacular spaces that are worth visiting. 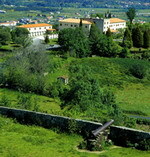 The Monastery is one of Galicia's oldest, founded in the 6th century a.c.e. The original construction is Romanesque, though does show Gothic tendencies. Worth nothing are its 18th century baroque facade, its monumental staircase and its three cloisters.. 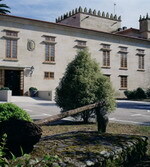 This Parador occupies a palace which was formerly the residence of the Counts of Maceda. It rises up in the historical centre of the town and combines regal, noble and stately lines with innumerable references to a rural dream in a setting which invites you to visit numerous coves and beaches. Distinguished, stately and illustrious are three adjectives which define an interior where famous details, antiques and regal style furniture abound, and there are also relaxing views over the garden. The carved stone staircase which leads to very welcoming bedrooms and which accentuates the stateliness and nobility of the Parador stands out. Occupying the Monterreal Peninsula, this is one of the most extraordinary Paradores, half medieval fortress and half Galician stately architecture. It rises up as an impressive viewpoint over the ocean, surrounded by a walled enclosure, protected by the sea and flanked by a beautiful pine wood. 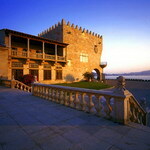 The Parador has regal and elegant common rooms in which decorative elements from other times abound. Stately living rooms and spacious bedrooms, many with views of the sea, make up a grandiose interior in which the splendid stone staircase of the entrance hall stands out. The former Pazo de Bazán country house, an ancestral mansion on which construction begain in the 17th c., is located in the green landscape of the Rías Baixas, specifically in the Ría de Arousa. 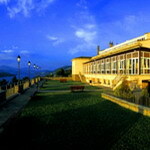 Luxuriant pine groves, beaches, coves and numerous country houses run along the Galician coast. 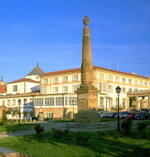 The Parador is located in the centre of the small town of Cambados, a short distance from the Isla de la Toxa, and has an attractive inner courtyard in which the arcades, the fountain and a slender palm tree stand out. It also has pleasant, bright bedrooms with comfortable furniture, along with stone columns, wooden ceilings and beams in the rest of the common rooms, not forgetting the garden and a tempting swimming pool. The Parador of the historical town of Tui, on the border with Portugal, faithfully reproduces a rural Galician country house, in a setting with mountains and rivers. This establishment is ideal for sports lovers and for outdoor activities. With its granite walls, Galician chestnut- wood floors, ceilings, beams and staircases, it recreates the decoration of the typical local country houses. The soft shades of the walls and the rustic furniture achieve a friendly and peaceful atmosphere in the comfortable bedrooms. It also has a splendid swimming pool and a beautiful garden. The Parador occupies a large Galician house at the mouth of the Eo, a marine and tourist enclave on the border of the Asturian coast. Its magnificent position, on the Asturian outskirts of Galicia, offers the possibility to contemplate unique views of the Galician countryside, the Eo estuary and the small Asturian villages on the other shore; those which can be seen from the dining room are extraordinary. A marine style prevails on the inside, with an air of grace and elegance. The bedrooms are friendly and comfortable, and some have splendid panoramic views. Located opposite the Monterrei fortress, the Parador recreates the construction of a traditional Galician country house, with a central battlemented tower, beautiful, panoramic views of the castle and Verín and the Valley's prestigious vineyards. Some of the bedrooms have views of the refreshing swimming pool and the gardens. 'Merluza a la gallega' (hake Galician style) and 'filloas' (type of crepe) in cream scented with eau de vie are good examples of the gastronomy on offer. This impressive medieval Galician tower, today a Parador, dominates the urban and rural landscape of this town in Lugo, capital of the fertile region of the 'Terra Chá', lands which grew up around this tower and in which the gentlemen of Andrade, Counts of Vilalba, would live. The Parador offers cozy, peaceful spaces with a medieval look; the 6 rooms located in the tower and the Salon de los Andrade also share this style, all with mural paintings and coats of arms. 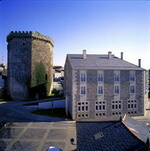 In the shadow of the tower stands the new building, wrought in stone and in the style of a typical Galician palace, where the remaining 42 rooms, bar, restaurant, etc., are located.